After this latest round of matches which included Newcastle’s 1-0 victory over Joe Mourinho’s players, the rankings have now been updated. 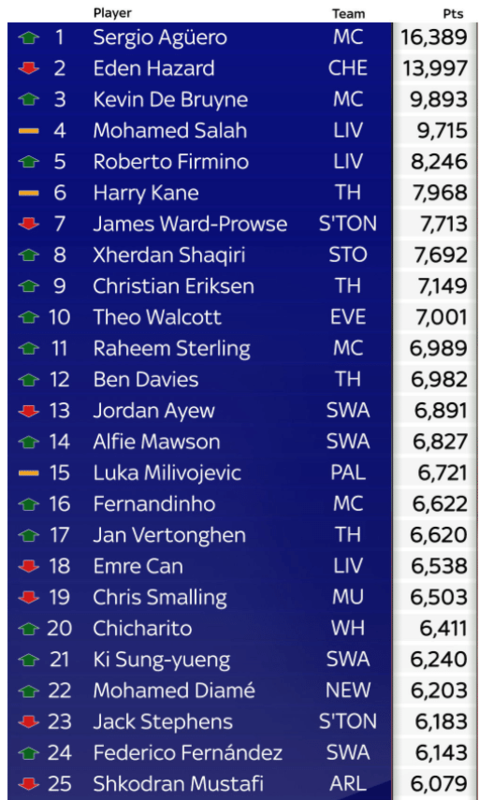 As you can see, Mohamed Diame features at number 22 in these latest Sky Sports Power Rankings with 6,203 points, up from 36th position and 5,898 points last week. No other Newcastle players feature in the top 50 of these latest Sky Sports Power Rankings – but if others can match Diame’s new-found quality and consistency, and build on the team and individual displays we saw against Man Utd, then there will be plenty more recognition for NUFC players. Mohamed Diame was excellent against Manchester United and of course scored Newcastle’s only goal the previous Sunday to earn a draw at Crystal Palace, now improved immeasurably, unrecognisable compared to the previous 18 months. In fact the upturn in form for the midfielder and team overall, started with victory at West Ham (Diame scoring one of the three goals) just before Christmas. After a run of only one point in nine games, Newcastle have now only lost to Manchester City (twice) in the last nine PL games, Mohamed Diame starting eight of the nine (he wasn’t selected for the Newcastle 0 Brighton 0 match), the Senegalese player only having been selected for four Premier League games previous to this run by Rafa Benitez. Newcastle’s positives this season have mainly centred around the defence, with only the top seven conceding less than NUFC’s 36 goals total. Centre-midfield has been a big disappointment, with any number of combinations of Shelvey, Hayden, Merino, Diame and Saivet used. However, with Shelvey having arguably having his best ever game for Newcastle on Sunday, and with Diame continuing his very good form, it is hard to see Rafa Benitez choosing any other combination against Bournemouth in 11 days time.